Andrzej Grzybowski has been named to the editorial board of the American Journal of Ophthalmology. He currently serves on the editorial boards of several other biomedical and history of medicine journals. 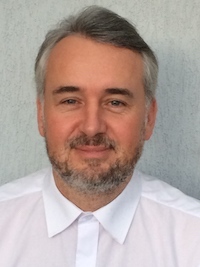 Grzybowski is Professor of Ophthalmology and Chair of the Department of Ophthalmology at the University of Warmia and Mazury, Olsztyn, Poland, and Head of the Institute for Research in Ophthalmology, Foundation for Ophthalmology Development, Poznan, Poland. He is active in several international scientific and medical societies, as well as the Cogan Society. Chris Blodi has announced his retirement from his clinical vitreo-retinal practice at Iowa Retina Consultants. We wish him good health and satisfaction in his retirement. He assures us that he will continue to be an active member of our Society, and that he loves working on papers for our meetings and sharing his interest of history with others. 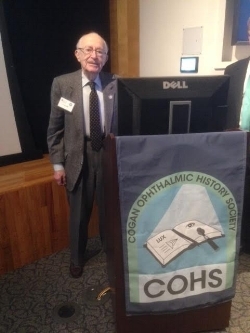 Richard Keeler presented an invited lecture at the Dutch Ophthalmological Society (Nederlands Oogheelkundig Gezelschap) meeting in March, 2018, to mark the 200th anniversary of Frans Donders birth. He discussed Donders life, career, travels, and relationships with other leading scientists of his time. The curious reader may see the entire program for the NOG meeting on an app available in the App Store. Robert Feibel was honored with the annual Distinguished Alumnus Award by the John F. Hardesty, MD, Department of Ophthalmology and Visual Sciences, Washington University School of Medicine in St. Louis. Feibel is an active Cogan Society member; he presented the 28th annual Snyder Lecture at the Society’s 31st annual meeting, held in Tampa, Florida, March, 2018. Ira Eliasoph (MSH '58) received the Mount Sinai Alumni Special Recognition Award on Friday, May 19, 2017. Chi-Chao Chan was the guest of honor and guest speaker at the Foster Society meeting on May 7, 2017, in Baltimore, Maryland. She is the 19th immunologist so honored by the Society. On April 20, 2017, George M Bohigian, MD, received the Presidential Award from the St. Louis Ophthalmological Society, given "For distinguished contributions and service to the ophthalmic community local and world-wide." Dr.Bohigian is Professor of Clinical Ophthalmology, Department of Ophthalmology and Visual Sciences, of the Washington University School of Medicine, St. Louis, Missouri. Mark Mannis received the 2017 Claes H. Dohlman Society Award, given to recognize a lifetime of excellence in the training of fellows in cornea, refractive surgery and external disease, and contributions to the profession, at the 2017 meeting of the American Academy of Ophthalmology. Congratulations to V. K. Raju, M.D. who was inducted into the UT Medical Missions Hall of Fame on April 1, 2017; view a video about this award here. which is dedicated to combating childhood blindness around the world.